Grover and our new kitchen floors. This was taken the same day everything was finished. G is a pup who doesn’t like change, so he sure is expressive in how he feels. December 2018 and January 2019 have been whirlwinds of months so far. The holidays tend to always get the best of me, and most people I think, but December 2018 was extra “extra”. January is also flying by, but I’ve stopped being surprised by how quickly time seems to move now, especially now that we have a baby. Time sped up the moment he was born, and only seems to be accelerating. Exactly a week before Christmas, Teddy’s first, I woke up to a flooded kitchen. There wasn’t what I had originally considered to be an incredible amount of water- i.e. nothing to match photos you see of flooded towns and houses after a natural disaster- but I quickly learned that even what seem like small amounts of damage can be very problematic. The flood luckily had been localized to our kitchen, but the water had seeped through our flooring and into the subfloor, necessitating industrial dryers and a near-immediate of the removal of our flooring to dry everything out Turns out that the baseboards were also damaged, as well as some of the drywall, so parts of the wall were torn off as well. Definitely what I wanted a week before Christmas, right? Right. Exactly. Our insurance company ended up being fabulous, and our contractor, who we have used for all our large projects in the house that we haven’t DIY’d ourself (i..e. the upstairs bathroom, building and tearing down walls, etc.) was able to step in and complete our floors before Christmas. Just when we thought Christmas was going to be ruined, Rafael showed up Christmas Eve morning and worked until the afternoon to ensure that our small family could enjoy Teddy’s first Christmas at home. If you’re in the D.C./NoVA area, we can’t say enough good things about Rafael’s Renovations. (If you are interested, please reach out and I will pass along his contact info to you.) I have lots more I could share about our frantic design process (including how we decided on these fabulous tiles at 9pm on a Wednesday night in the middle of a tile store with a crying baby), and I think it deserves its own post. If you’re interested, let me know! Maybe I will post a poll on insta to gauge the temperature for a home design post, since that definitely is different than my normal topic. Finished kitchen! So glad I went with the black and white colors earlier this fall when I repainted the cabinets and installed the black backsplash. The patterned tile really pulls everything together. Since we essentially didn’t have a functioning kitchen for over a week- literally ALL our appliances were removed from the kitchen and were placed all over our small house for storage- we replied heavily upon our instant pot for cooking. I’ve always been amazed at the instant pot, but I sure was grateful we had one, because takeout gets old quickly. It even inspired me to write up this recipe here for instant pot ramen. This is one of my favorites dishes of all time, and the bone broth base is perfect for cold winter nights, immunity, and digestion. Life with Teddy has been so sweet. He is the happiest baby, and almost always excited about something. 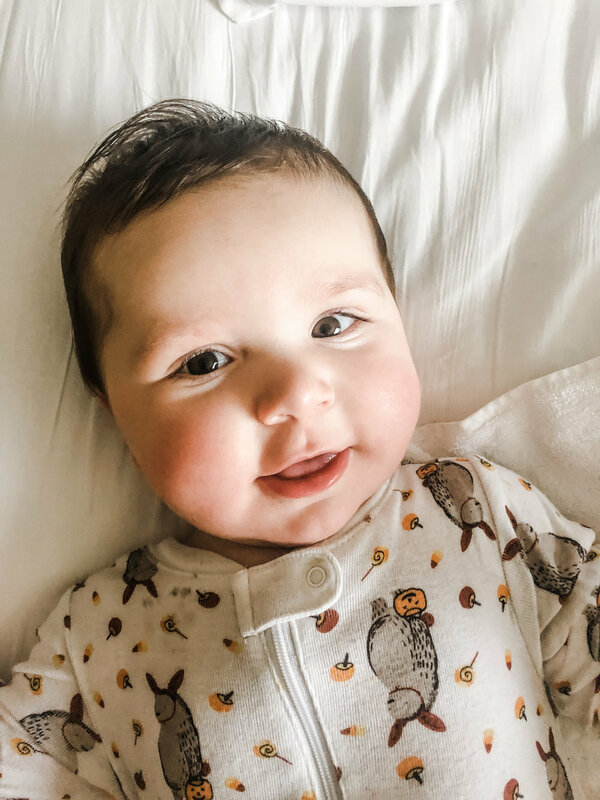 He genuinely loves new things, new people, and we think he’s turning into quite the extrovert, which shocked us as two parents who are introverted by nature. 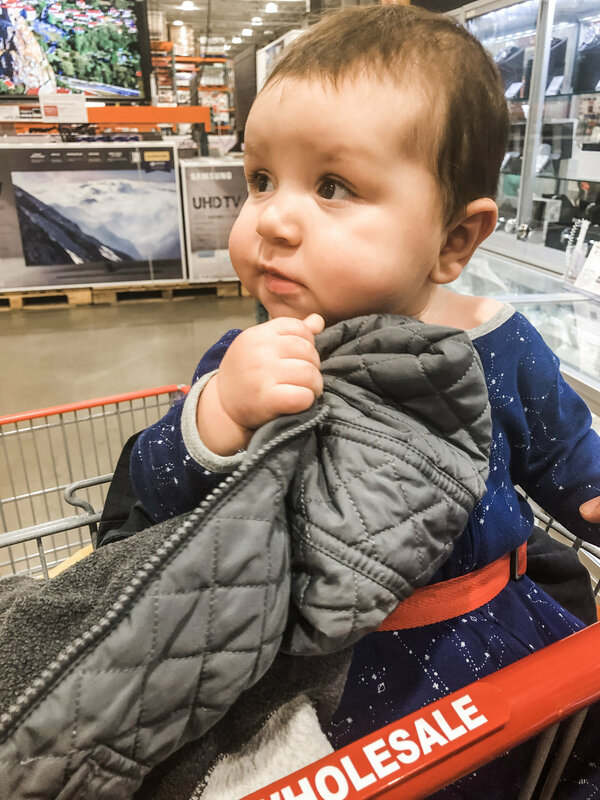 We took TK to Costco the other day and he was AMAZED by all the sights, smells, people, and noise. He loved it. Here are hardboiled egg yolks that I mixed with breast milk. (The less-than-vibrant color is due to my photo filter. Egg yolks are full of B12 and choline- essential nutrients for adults, but also developing bodies. A quick update on Grover… G continues to live his best life, which includes laying on every piece of furniture, hogging the bed, happily, eating food that TK throws on the floor, and furiously guarding the house from the squirrels who roam our backyard. I have been loooooooving all the blue tansy products from Primally Pure. I’ve long been a fan of the blue tansy beauty cream and body oil. (I credit blue tansy for making my skin glowy and now with scar healing.) When they released their blue tansy deodorant, I was super excited, and then when they bundled it all together, I was even more excited. This natural deodorant doesn’t use baking soda, which irritates sensitive skin, and the blue tansy smell transports me to spring. It really is magical and worth the cost. Just to be clear, I don’t get paid from them to say this….I just really love them. For anyone wondering, these floors are in our bathroom and have held up so well. I posed this on insta right when I found it, because I was so elated. I’ve long been a fan of Bulletproof products, and have long nerded out on Bulletproof Radio. This Brain Octane Oil is what I blend into my BPC, and its cost truly is prohibitive. This is a good way to try without the investment, and from what I can tell, its only available in-person at Whole Foods. Its also obviously great for travel, ESPECIALLY when paired with the travel packs from Vital Proteins collagen. Speaking of Vital Proteins, I found three flavors of their new collagen shots, and even snagged them on sale during the Whole Foods supplement sale. I will likely post on my instagram about them when I have more of a firm idea about who they are good for and how to utilize them best. The concept of these is just so cute though. Tk and G and I love taking walks around our neighborhood (G never can have enough walks) and have found a few of these free libraries in our neighborhood. I loooooove them. As I have found a little bit more of a pathway to work-life-baby balance, I’ve been cooking more. As you know, cooking has always been a passion of mine, and I’m excited to jump back into it. I’ve been working on transitioning my husband to keto, slowly, and for a short-period of time. I’m a firm believer that keto is a therapeutic diet, and meant to be short term or medium term…not long term. I think I will talk about this later, perhaps in its own post, because keto is certainly blowing up, having a moment, and is being pursued by so many. I’ve been really leaning into getting back into preparing my homemade favorites. I have loooooooved making homemade ranch dressing (seriously so tasty! ), and last week I made shakshuka with goat cheese, which make our whole house smell incredible. Homemade ranch is so easy and satisfying. Finally, I end this post with this gorgeous view from New Mexico. When we lived in Las Cruces, this was actually our backyard- our house edged up to preserved land. This shot is just so beautiful and snowy….seems to perfect to share in the middle of winter. Happy Sunday!